November 2011: Letsrecycle.com story highlighting how “All residual waste collected from the City of London’s 9,000 residents and street cleaning operations is being processed in Cory Environmental’s £350 million energy-from-waste (EfW) incinerator at Belvedere in Bexley, South East London. The Belvedere EfW plant, known as the Riverside Resource Recovery facility, has the capacity to treat 585,000 tonnes of waste a year… The Corporation of London said the plant was ‘one of the most efficient facilities in Europe’ – and would generate a net of about 66MW of electricity, feeding into the National Grid with enough electricity to serve around 100,000 homes.” Read the full story here. More on the Belvedere waste to energy plant here. 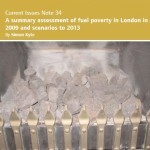 November 2011: GLA Economics note which “examines the current state of fuel poverty in London. It contends that the current, official, DECC measure for fuel poverty (using ‘full income’) underestimates the incidence of fuel poverty in the capital due to the inclusion of housing-related benefits as income under that measure. 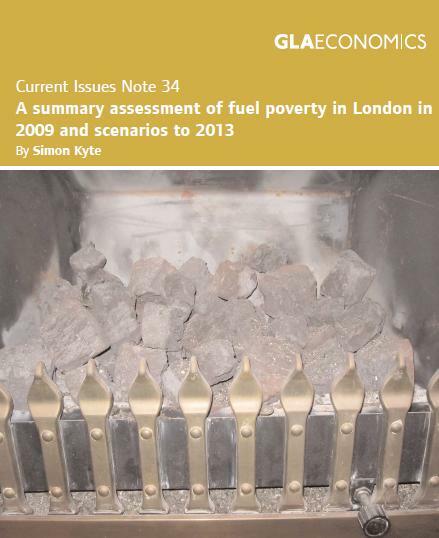 Using a ‘basic income’ measure (rather than ‘full income’) raises the incidence of fuel poverty in London households from 13.3 per cent to 18.6 per cent. 25 November 2011: Interesting data on key economic metrics for London as well as data in relation to housing growth in the capital. The GLA Housing Team briefing can be viewed here. London – What Future for CHP and District Heating? November 2011: Slides from a recent presentation made by Peter North, Senior Manager of the GLA’s Sustainable Energy Team. Includes information on the GLA’s new Decentralised Energy Project Delivery Unit (DEPDU). Further information on London’s DE plans can be found in Chapter 4 – Securing a Low Carbon Energy Supply for London – of the Mayor’s recent Climate Change Mitigation and Energy Strategy, as well as in the 2009 report ‘Powering Ahead‘. Can localism deliver on the green agenda? November 2011: This month the Mayor answered London Assembly questions in relation to: London’s connection to the National Grid; indirect or Scope 3 CO2 emissions; the Mayor’s Meeting energy companies I and Meeting energy companies II; an Update on home energy efficiency scheme RE:NEW; Boroughs rolling out home energy efficiency scheme RE:NEW; and the National roll-out of home energy efficiency scheme RE:NEW; Energy Efficiency in the Private Rented Sector; EDF’s Energy Costs; the Mayor’s Environmental Record; Renewables installed through RE:NEW and RE:FIT; the Mayor’s Prize for Low Carbon Technology and TfL’s increased CO2, and the Mayor’s comparison of Germany’s home energy efficiency retrofit programme and the Green Deal. 24 November 2011: News release from London Assembly member John Biggs: “Mayor Boris Johnson has been criticised for failing to deliver on his flagship policy to reduce fuel bills in East London. As local residents face huge energy price hikes this winter, new figures reveal that the Mayor’s promise to insulate 200,000 home across London has flopped…At the current rate it will take 23 years to ‘green’ 200,000 homes as promised. Even then this would be just a fraction of the 3.4 million homes in the capital. Full story here. Further information on the Mayor’s RE:NEW programme here. 24 November 2011: Press release announcing details of the Mayor’s £20,000 prize designed to help to reduce carbon emissions from London’s buildings. The competition is open to all undergraduates and postgraduates at Further and Higher Education Institutions in London. “The Mayor hopes the winning entries could in the future be used to help drive investment specifically in building retrofitting activity, which could deliver up to 80 per cent of the 14,000 low carbon jobs that City Hall figures estimate could be created each year, and two thirds of the £721 million of low carbon economic activity per year up until 2025.” Further details here. What are the social impacts of climate change in the UK? 24 November 2011: Joseph Rowntree Foundation (JRF) commissioned research, published today, which highlights that the people who emit the least carbon in the UK are most likely to suffer from the consequences of climate change. The short note prepared provides some useful information on London including the fact that London has the highest proportion of hard-to-treat properties of all the regions, with 58% being solid-walled. November 2011: The North London Strategic Alliance – made up of the Enfield, Haringey, Waltham Forest – have together with the GLA commissioned a study looking at the Upper Lee Valley – identified in the London Plan as the capital’s largest Opportunity Area – to “understand the current low carbon economy and potential for green growth, together with clear, strategic actions to support that economic expansion.” The report ‘Upper Lee Valley Low Carbon Economy: Opportunities, Barriers & Interventions’, produced by GVA Grimley, was published earlier this year and is downloadable here. Some further information on proposals for a North London Decentralised Energy Network is posted here.